Forgive me if I start out with a pun to describe the new comedy The Lady in the Van. It’s basically little more than a vehicle for the legendary actress Maggie Smith. To add insult to injury, I’ll continue with another pun: it’s a pretty stalled vehicle when all is said and done. The cental premise is based on something that sorta, kinda happened to the British playwright Alan Bennett (The History Boys, The Madness of King George). After striking up a conversation with the neighborhood bag lady who lives in her van, and after not being able to shake her off, the playwright acquiesces to her suggestion that she park her vehicle in his driveway. He agrees, more out of an inability (or cowardice as he describes it) to say no. It’s only supposed to be for a little while, but she stays there until she dies fifteen years later. Even though this is a vehicle for Maggie Smith, she is only fitfully effective, and I think that this may be because her character is more a construct than a real person. I mean, Bennett’s bag lady here is not your run of the mill everyday type of bag lady. No, here she is a former concert pianist and ex-nun who has gone into hiding because she thinks she is responsible for the death of a motorcyclist (she’s not) and who is being blackmailed by a police officer. To be fair, this may actually all be true (Alan Bennet only says that some of it is), but it just doesn’t feel like it. It feels more like a sort of a romantic patina one gives a character when a writer doesn’t think the character is interesting enough on their own, or doesn’t trust the audience enough to give them the real thing. And he may be right. 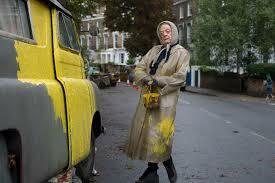 It is quite possible that the real lady in the van was as banal and boring as most of us are. But even so, if Bennett did improve the character, I’m not convinced he made the right choices. And so the movie never really gets going. With Alex Jennings as Bennett (he played Prince Charles in The Queen), Jim Broadbent as the vile police officer, and James Corden in a bit part as a market trader. It’s also filled with dozens of actors that one recognizes from various British television series and movies, but you can’t quite remember their name can remember where else you saw them. 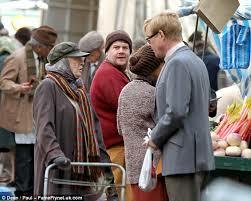 Alan Bennett adapted his own play and Nicholas Hytner directed. They both worked together on other Bennett films, The Madness of King George and The History Boys. 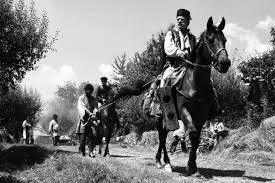 Aferim!, the new Romanian film written by Florin Lazarescu and the director Radu Jude, also begins with a pun: it’s a road movie that never gets out of first gear. The plot, in many ways, is fairly simple. In early 19th century Romania, when gypsy slavery was still allowed, and the economy so bad that whole families would sell themselves to landowners, Constandin, a roly poly police officer, is hired by a landowner to find and return a slave who has run away after having an affair with the landowner’s wife. Constandin, along with his son, travels the Romanian countryside and sees the sights until they find said slave and return him for a horrifying punishment. That’s about it, sort of. Along the way, the two men go through a market place that has a Ferris wheel. The father pays a prostitute to sleep with his son so he can lose his virginity. Songs are sun, liquor is drunk and every once in a while they yell out Aferim! (bravo) to each other. Aferim! isn’t uninteresting though it’s not particularly interesting either. 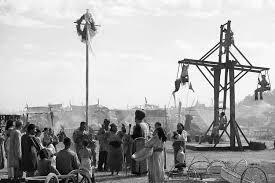 It does what it sets out to do and does it rather effectively (show us how horrible life could be at this time and how bad the gypsies were treated at the time). It has gorgeous black and white cinematography (Marius Panduru, by way of two other notable films from the Romanian new wave, 12:08 to Bucharest and Police, Adjective) and a fine downbeat sense of place and time. But I think the main issue is that everything is done on the same level of tension. Every scene has as much impact as the previous one. It never feels like the story is building toward anything. It’s like driving somewhere at the same constant speed and all you see for miles and miles is the same exact scenery. With Teodor Corban as Constandin. He can also be seen in 4 Months, 3 Weeks, 2 Days and 12:08 to Bucharest. Aferim! is Romania’s entry in the 2016 Academy Awards.